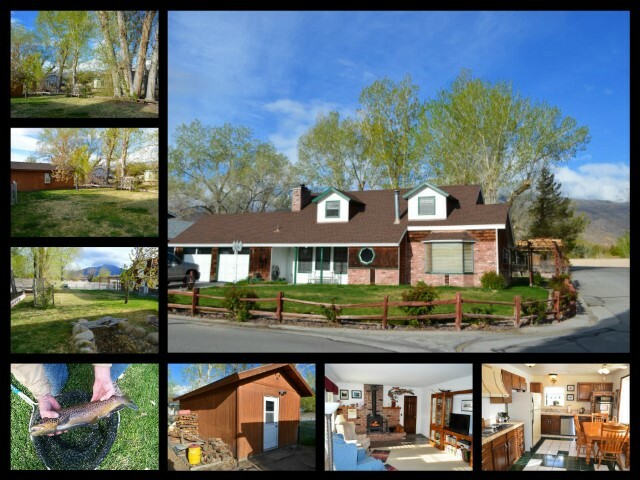 145 Elmcrest Drive, Big Pine CA- Back on the Market! 145 Elmcrest Drive, is located in the Rolling Green in Big Pine, California. This friendly neighborhood is just outside of Big Pine, and you will often see your neighbors out walking with their families and pets. This well kept 2 story home offers 4 bedrooms, 2.5 bathrooms, bonus room, and attached 2 car garage. The 2 bedrooms upstairs offer an abundant amount of storage space, or could make the perfect children hideout/club room. The kitchen features a 5 burner stove top, double ovens, dishwasher, wood burning stove and much more. The large open living room offers an additional wood burning stove and large front windows. This property is located on a corner lot of 0.21 acres with a workshop located in the backyard. Both the front and backyard is fully landscaped with automatic sprinklers. There is a meandering creek in the backyard that offers beauty as well as an exclusive prime fishing location. The current owners have caught trout up to 5 lbs from their own backyard! Enjoy the views of both the Sierra Nevada Mountains and the White Mountains from the patio, which is shaded by grape vines in the summer months.